You know what the biggest problem with music today is? 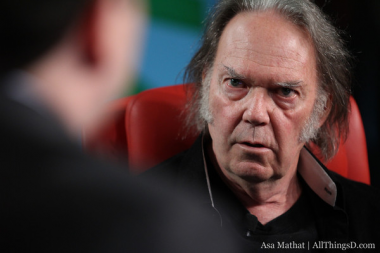 That’s Neil Young’s take on the issue, anyway. For years, the musician has been obsessed with improving the way modern music sounds, sonically speaking. In an interview with Walt Mossberg and Peter Kafka at our D: Dive Into Media conference, Young, the perennial music purist, said that while modern music formats like MP3 are convenient, they sound lousy. While modern digital encoding schemes might sound clear on our iPods and smartphones, they only feature a small percentage of the musical data present in a master recording, and Young is on a crusade to correct that. Young proposed that fans stage a grassroots movement to demand higher-quality audio. “Occupy audio!” he urged. So what’s the solution? New hardware capable of playing audio files that preserve more of the data present in original recordings, said Young. Ah. But who’s going to produce that? And evidently there once was some rich guy working on just such a device. The late Apple CEO Steve Jobs. Also a topic of conversation during today’s interview: The recording industry, and whether the record label has outlived its usefulness. Young contended it hasn’t. Then why is it the case that some artists complain so much about the economics of the industry? Finally, Young discussed piracy, which he doesn’t view as the threat that some other musicians do.